Auto Insurance protects you against financial loss if you have an accident. Personal Auto Insurance rates depend on the type of car you drive and the amount of coverage you’re looking for. Car insurance policies are actually a package of different types of insurance coverage. Don’t see what you need insured on our list? Give us a call. *24-hour roadside and lakeside assistance for both boats and the vehicles they are towed with can be purchased. Your personal auto insurance does not cover you to use your vehicle for commercial purposes such as ride-sharing, pizza delivery, newspaper delivery and more. You can purchase commercial auto insurance to cover these instances. Both of these are physical damage coverage and subject to a deductible. Comprehensive covers vandalism, deer hits, hail damage, etc. Collision covers when you hit a vehicle, back into a pole, etc. What is GAP coverage? Is this something that you offer? GAP coverage is for the difference between your loan and the depreciated value of your vehicle. You can typically get this through your insurance carrier or your financial institute. You do need to ask what the coverage differences would be between the two. Should I take the insurance for a rental car? It depends upon your current coverage, who is renting the vehicle, who is driving it and where it is being driven. Call to discuss as this varies by company. What is replacement cost coverage on my auto policy? Replacement cost coverage may be available on your new car. Please call or contact us to discuss. Does auto med pay pay out to me, my passengers &/or others? The auto Med Pay coverage protects you if you’re in a covered accident. This also covers any passengers in your vehicle. When should I remove physical damage? This is unique to every situation and individual. Truly depends on financial situation of individual, value of car, etc. When should I add my young driver? Typically when they get their driver’s license. How can I get an auto ID card? You can request this from us several different ways. You can call us during business hours, use the Contact Us form on our website or e-mail [email protected] Let us know how you wish to receive it and we will get it out to you. What does BI, PD, MP, COMP, COLL, UM & UIM stand for? These are referring to personal auto liability and physical damage coverages . The following are liability: BI = Body Injury, PD = Property Damage, MP = Medical Payments, UM = Uninsured Motorist, UIM = Underinsured Motorist. Physical Damage coverages are: COMP = Comprehensive coverage, COLL = Collision coverage. Use this Teen Driving Contract to go over the rules of the road and go over consequences. According to the NHTSA, 1 in 3 people are invovled in a car accident at some point in their lives. Do you know what to do? Having the right plan will make all of the difference and could save you money and time down the road. 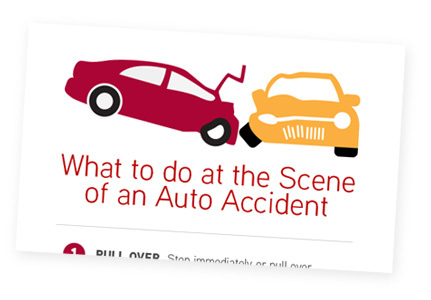 Keeping our free guide handy will help you know what do if you get into an automobile accident.